the [football] backdrop. The man. the large gold toilet is above and -4 feet to the right of the man. it is facing southwest. it is leaning 35 degrees to the left. 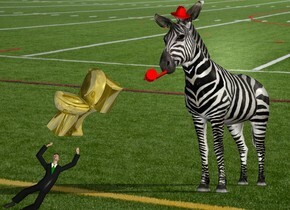 the huge zebra Is 6 feet to the right and 7 feet behind the man. It is facing southwest. the enormous red whistle is 5 foot above and 5 feet to the right of the man. it is upside down. it is leaning 30 degrees to the right. The red hat is 4 foot above and 4 feet to the right of the toilet.it is leaning 35 degrees to the front. It is morning.